Much has changed since the times when the first roads were built in Britain almost 2,000 years ago. Today, the United Kingdom is criss-crossed by hundreds of thousands of miles of roads of all types and lenghts. Approximately 40 million cars navigate these roads every day, so if you happen to drive one of those cars, you might be interested in finding out which are the best and the worst roads in the country. The A74, a former mail route that linked Carlisle and Glasgow and one of the main connections between Scotland and England until the 1950s. Since the inauguration of the M74 in the 1960s and its subsequent extensions, the A74 has become a favourite dual carriageway due to its low traffic and excellent maintenance. - The A404, especially once you leave London and enter Buckinghamshire. You can expect a particularly fast and smooth drive between Maidenhead and High Wycombe, and plenty of services all along its full length. - The A75, a 95-mile long single carriageway whose surface was recently improved to accommodate higher traffic volumes. The road begins north of Carlisle and goes past Dumfries and Glenluce before ending at Stranraer, near Loch Ryan. - The A52, one of the most important arteries in the East Midlands that runs for 147 miles between Newcastle-under-Lyme and the coastal town of Mablethorpe. Roundabouts, bridges, old drainage constructions, and plenty of bends with excellent visibility keep drivers entertained and make for an enjoyable ride. - The A6 road, especially in the stretches between Leicester and the Peak District, and between Carnforth and Carlisle. This road combines a greal deal of services for motorists, varied and interesting landscapes, good maintenance, and fast surfaces. When it comes to road safety, the United Kingdom has one of the best-rated road networks in Europe. According to data released by the Department for Transport, Great Britain was at the bottom of the table when it came to the number of deaths due to road accidents, with only 33 fatalities for every million of population and only preceded by Sweden, with 31. The roads that have improved their safety standards more significantly include the A4 section between Llandovery and Carmarthen, the A605 as it passes through Cambridgeshire, the A453, and the A38 between Derbyshire and Staffordshire. When the number of accidents and fatalities are taken into account, the A537 appears as one of Britain's most dangerous roads. This road (also known as the Cat and Fiddle road) runs between Cheshire and Derbyshire, crossing the Peak District National Park and Manchester along the way. In the three years between 2003 and 2005, the number of serious accidents increased by 127 per cent, with the most dangerous stretch being the one that links Macclesfield with the Cat & Fiddle Inn. The A43 road between Torcester and Corby is also notorious for having a high number of fatalities, mostly involving collisions with trucks. Another particularly dangerous stretch is the one between Northampton and Kettering. Other hazardous roads include the A675 between Blackburn and Preston, the A54 between Buxton and Congleton, the A61 between Wakefield and Barnsley, and the A18 between Luborough and Laceby. Unsurprisingly, the busiest roads in the UK are those near the capital. The M25 is notorious for its semi-permanent congested status, and it has been voted as the country's worst road in several occasions. The A40 stretch between central London and Oxford is also top of the list. 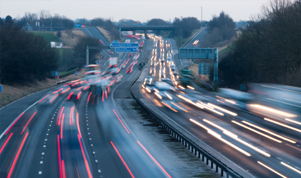 Outside London, the busiest roads can be found in Merseyside (A59 and M53), Greater Manchester (A57, M6, and M62), Hampshire (A30 and Ringway North), Hertfordhsire (A5183 and Winston Churchill Way), and Essex (A414). The B3306, which hugs the western coast of Cornwall from east to west. The road begins in St Ives and continues for 13 miles through idyllic landscapes until it reaches St Just. - The Evo Triangle. Not a road itself, but rather a route along three roads (A543, A5, and B4501), which is commonly used to test drive cars because of the challenges it presents. The route runs from 20 miles of moorlands, hills, and the rugged landscapes of North Wales. - The A686 between Penrith and Haydon bridge, which goes past remote market towns, historic constructions like Hadrian's Wall, Benedictine monasteries, and the spectacular Penine mountain range.